A nighttime hike offers visitors the chance to see–or hear–nocturnal creatures such as great horned owls. The sun is low and the gate guarded as we arrive at the south shore of Lewisville Lake, some 30 miles north of downtown Dallas. Officially, the Lewisville Lake Environmental Learning Area is closed for the day. But my traveling companion and I are here for one of the guided night hikes. So the volunteer manning the gate checks our names and waves us through. Lewisville Lake Environmental Learning Area is at 201 E. Jones St. in Lewisville. The preserve opens daily; summer hours (Mar-Oct) are 7 a.m.-7 p.m., winter hours (Nov-Feb) are 7 a.m.-5 p.m. Entry costs $5 per car. Call 972/219-3550. As we drive along the gravel road, a steep, grassy slope towers on our left. On the far side of this earthen dam, the lake presses like a huge, three-toed dinosaur footprint into the path of the Trinity River’s Elm Fork. To our right stretches the 2,685 acres of protected prairie, forest, and wetlands that make up the Lewisville Lake Environmental Learning Area (LLELA). In 1955, when the Lewisville Dam was finished, this land was designated for flood control. It wasn’t until the 1990s that a consortium including the city of Lewisville and the University of North Texas joined together to create LLELA to protect the property and restore it to its “pre-settlement” state. Director Kenneth Steigman, a research scientist, likens the area to a “biological ark” for preserving native flora and fauna amid the flood of development spreading across north-central Texas. “The long-term plan is preserving the property … for the biodiversity that’s here, for the opportunity for education, for research, and also recreation for the general public,” he says. Arriving at the preserve’s pavilion, we find a group of about 30 people waiting for the night hike to start. 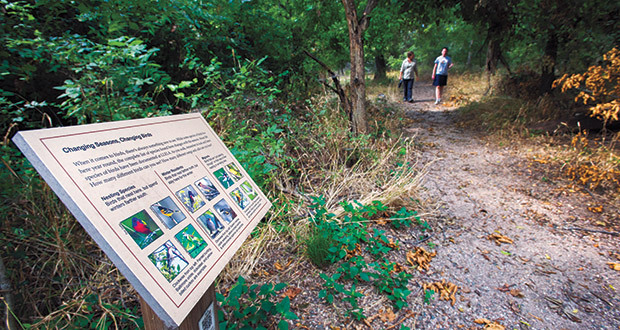 Diane Wetherbee, a LLELA environmental educator, explains that the area is an ecological crossroads bisected by the verdant bottomlands of the Trinity River’s Elm Fork. To the east and south is the Blackland Prairie that Dallas was built atop. To the north and west is a wooded region known as the Eastern Cross Timbers. Within the confluence, LLELA maintains public trails and waterways and organizes activities like kayak tours, birdwatching, fishing, primitive camping, and the “Stars on the Prairie” stargazing program. For the hike, Diane divides us into three groups and says we’ll be listening and looking for night creatures such as armadillos, owls, and opossums. Larger mammals like bobcats and coyotes, while present, will probably stay well clear of groups our size, she notes. The sun sets as our group hikes into the preserve along Cottonwood Trail. Cedar trees, spectral in the twilight, grow on one side. Opposite is a marshy area. Visibility is not a problem, even without flashlights, due to ambient light from the surrounding city. Soon our group stops as those in front point and whisper excitedly. They have spotted a great horned owl near the trail. By the time I see it, the bird is flapping off into the sky. Our guide, LLELA volunteer Mike Petrick, leads us to a small waterfall. The park is draining from recent heavy rains, and the air smells like damp earth. Mike uses his phone to play the call of a screech owl. We wait expectantly, but nothing answers. Back on the trail, we encounter members of another group, who excitedly report a beaver spotting at a nearby pond. They continue on their way, and we approach the pond cautiously. We file into a bird blind, trying to be quiet. But the beaver makes no curtain call, so we continue on. The trail twists around, and soon the trees open into a clearing and a rustic pioneer homestead. The centerpiece is an 1870 log cabin originally constructed nearby in an area now known as Highland Village. The city of Lewisville moved the cabin to the preserve and restored it in 2005. Though it’s too dark to make out details, Mike points out the basic elements of the scene, including a crude dugout where the family would have lived while the cabin was being built, a small smokehouse for curing meat, and the cabin’s half dovetailed corners and wooden shingles. Mike notes several picnic tables, where school groups gather for presentations about pioneer life. A couple in our group then tells us about having come to one of LLELA’s annual Homestead Christmas parties, complete with hot cider and fiddle music. Later, another guide recounts the tale of one such Christmas party on a bitter cold December night. Revelers were huddled happily in the cabin with music and hot cider when someone knocked on the door. It turned out to be an adjacent landowner looking for a stray bison. Seeing the light and hearing the music, he must have felt he’d walked back in time. Such yarns make me realize there is something about being in the woods at night that inspires storytelling. This, as much as the chance to see wildlife, is a high-light of the hike. We leave the cabin and make our way to the Cicada Trail, entering a river-bottom forest where gnarled oak, elm, and pecan trees tower overhead. To our right is the muddy old Trinity riverbed, whose course was moved east when the dam was built. Mike estimates the age of one pecan tree at 200 years. We haven’t seen any animals in awhile, and as we proceed down the trail we hear a distinct call up ahead. Mike holds up a hand, stopping the group-—a screech owl. It sounds again. Everyone moves slowly, quietly forward. Realizing something, Mike chuckles and shakes his head as he picks up the pace. We are back at the pavilion where we started. Diane’s group has already arrived. She was playing the screech owl call on her phone. With everyone back together, there are more stories. Each group has seen something unique. Ours is envied for the great horned owl, another for spotting some bats on the wing. Before the evening is done, LLELA volunteer Clyde Camp, who leads the Stars on the Prairie outings, takes out a laser pointer. The narrow beam seems to graze the stars as he outlines Orion the hunter squaring off against Taurus the bull, as well as other constellations. It is an appropriate finish to the evening, a night of stories wrapping up with some of the oldest stories of them all.